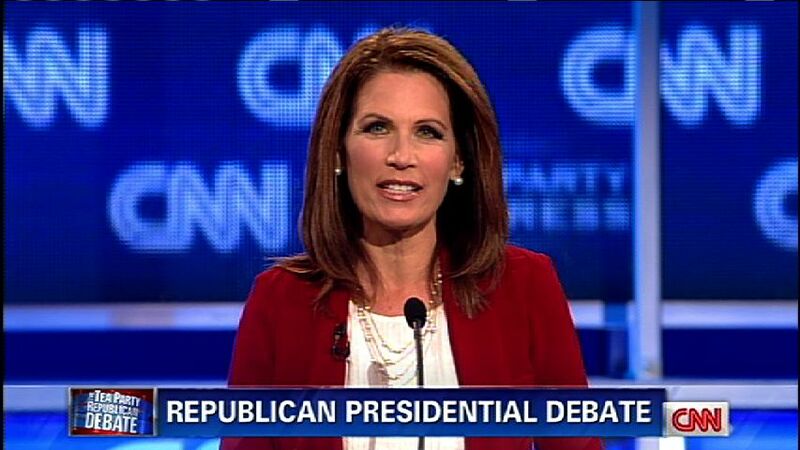 Rep. Michele Bachmann, R-Minn., in a Sept. 12 GOP presidential debate in Tampa, Florida. (CBS) Michele Bachmann is getting heat from medical experts after making some eyebrow-raising comments about childhood vaccines. Speaking in the presidential debate, Bachmann said Texas Governor Rick Perry's 2007 order mandating human papillomavirus (HPV) vaccines for school girls was a "violation of a liberty interest," CBS News reported. "I'm a mom of three children," Bachmann said during the debate in Tampa, Florida. "And to have innocent little 12-year-old girls be forced to have a government injection through an executive order is just flat out wrong." Bachmann went one step further the following day on the Today Show, saying that a mother came up to her in tears following the debate, and told Bachmann that her daughter became mentally retarded after receiving the HPV vaccine. "It can have very dangerous side effects," she said on Today. "This is the very real concern, and people have to draw their own conclusions." Cue the medical community. Experts immediately jumped to debunk these claims. The American Academy of Pediatrics released a statement to "correct false statements" Bachmann made on the HPV vaccine. "There is absolutely no scientific validity to this statement. Since the vaccine has been introduced, more than 35 million doses have been administered, and it has an excellent safety record," the statement read. This is a life-saving vaccine that can protect girls from cervical cancer." The medical consensus among officials recommends 11- and 12-year-old girls should be vaccinated because that's the age when the vaccine produces the best immune response in the body, and because it's important to protect girls before they are sexually active, the academy said. The CDC said, "Both vaccines were studied in thousands of people around the world and vaccine safety continues to be monitored by CDC and the FDA." The agency found no serious side effects, and found the most common side effects were soreness and swelling in the arm where the shot was given, fainting, and dizziness. Bachmann's claim echoes the claims that vaccines cause autism, which have been widely debunked since the landmark Lancet study - which has since been retracted - reported a link, CBS News reported. "Congresswoman Bachmann's decision to spread fear of vaccines is dangerous and irresponsible," Evan Siegfried, a spokesman for the Global and Regional Asperger Syndrome Partnership, told Politico. "There is zero credible scientific evidence that vaccines cause mental retardation or autism. She should cease trying to foment fear in order to advance her political agenda." Click here to learn more on 10 deadly myths about childhood vaccines.